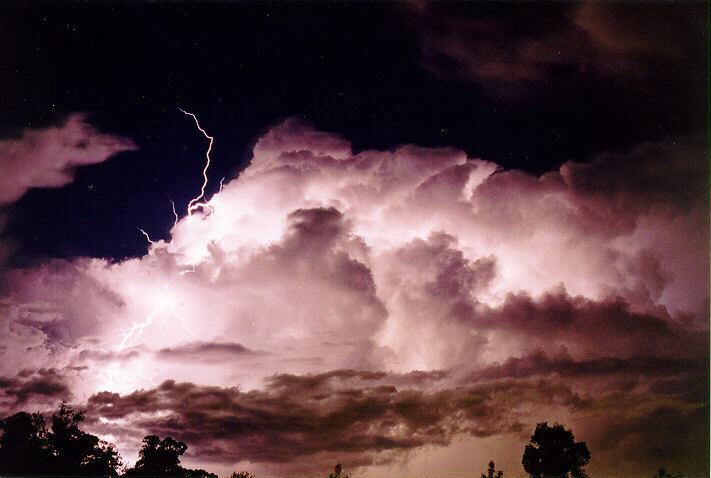 Most people are able to recognise thunderstorms from their typical characteristics of lightning and thunder. Thunderstorms are not 'objects' that move. They are 'atmospheric processing machines' consisting of updraughts which feed moisture and energy into the thunderstorm and downdraughts which emit the excess air back out of the thunderstorm. 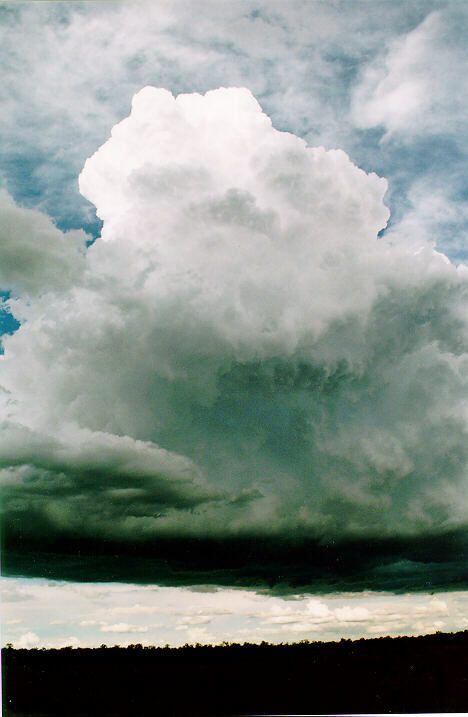 Inside the thunderstorm, the air flows and condenses under the appropriate conditions and rainfall as well as other forms of precipitation such as hail may be produced. 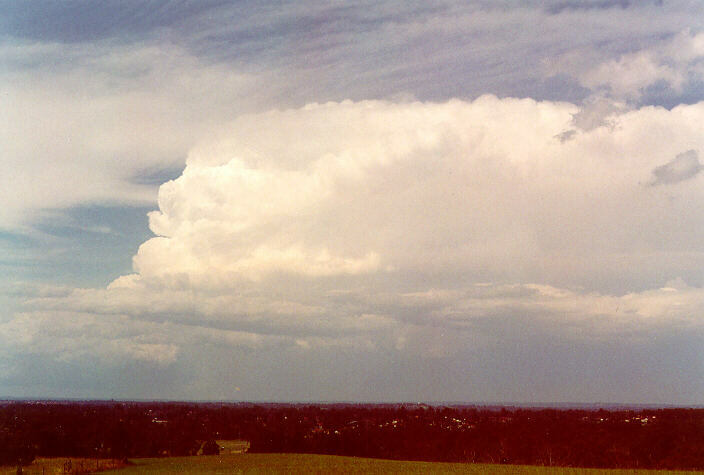 Identifying thunderstorms from observations in clear conditions is usually very easy. 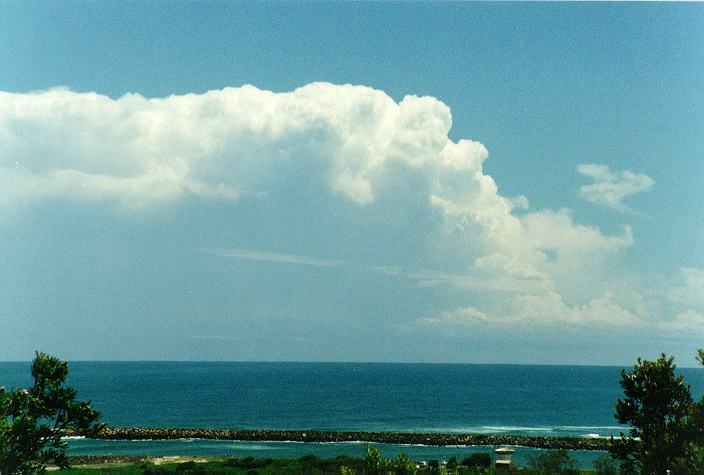 Thunderstorms are relatively large systems compared to other clouds. 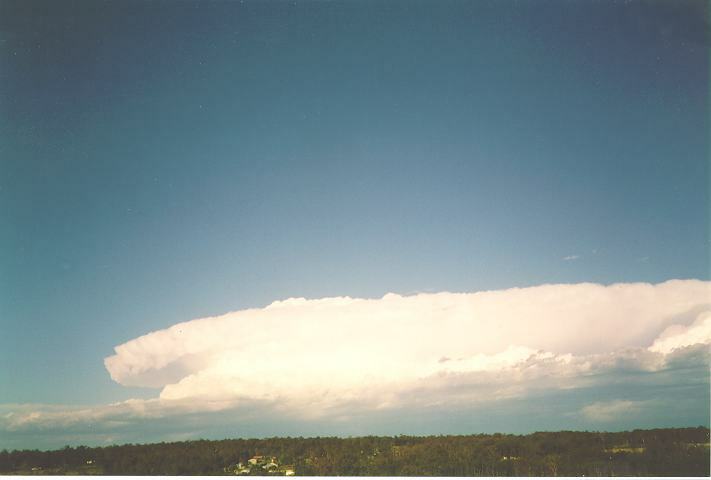 They contain a wispy white top projected forward into the line of direction of the winds and is called the anvil. 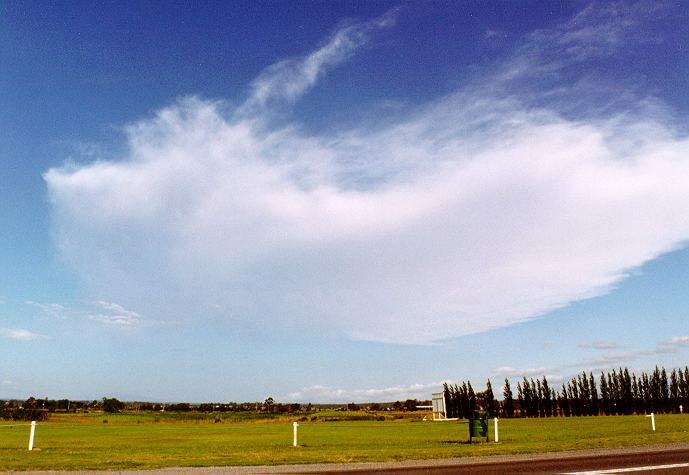 Anvils resemble the features common to cirrostratus and cirrus. The tops of thunderstorms are also bright to brilliant white but are flattened and protrude outwards mainly along the anvil. 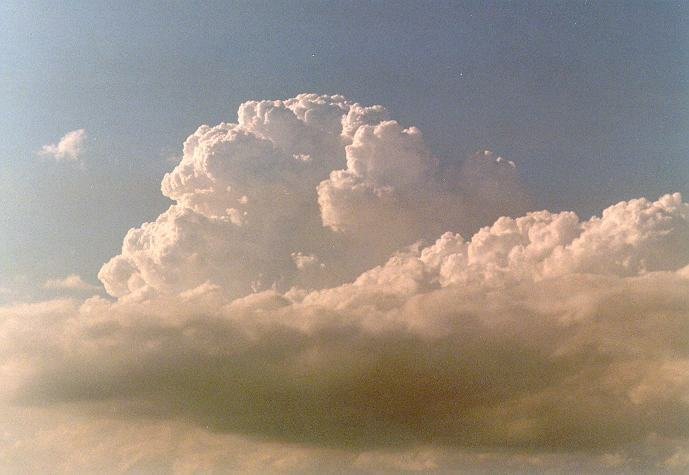 The main section or body of cumulonimbus is the thickest section and exhibit bulging cumuliform features typical of tops of cumulus just like the shape of a cauliflower. 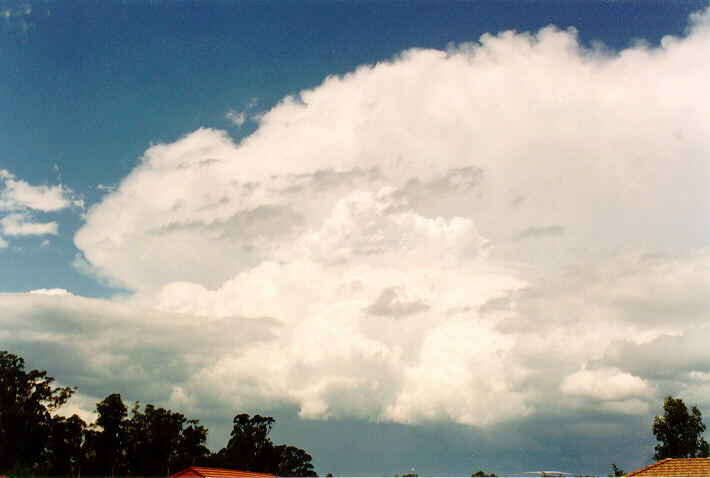 Thunderstorm clouds are relatively quite deep from their bases to the tops, reaching heights of up to or even over 20 kilometres. They usually consist of dark bases with heavy precipitation falling at the rear section of the storm. 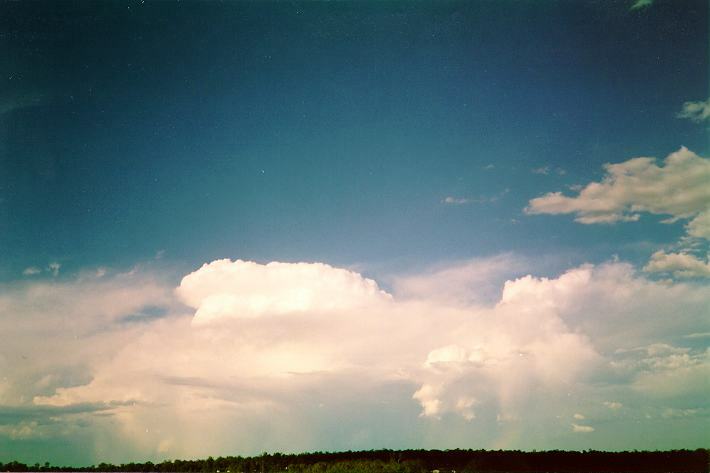 Once cloud begins to obscure the view of thunderstorms, it becomes increasingly difficult to observe them. 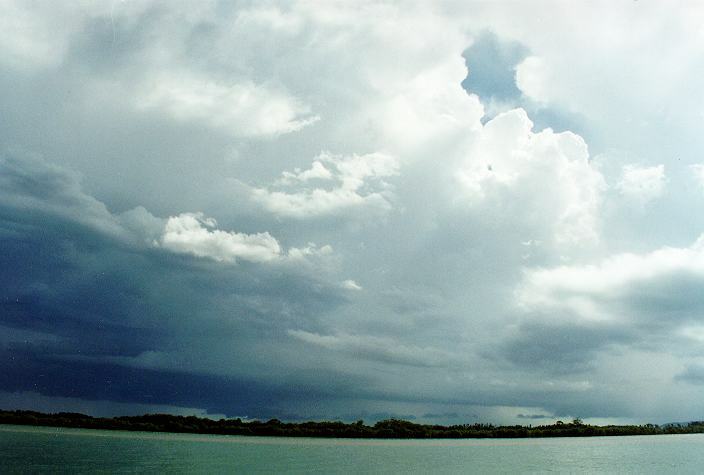 It takes some experience as well as more time to determine if there are thunderstorms hidden by clouds. 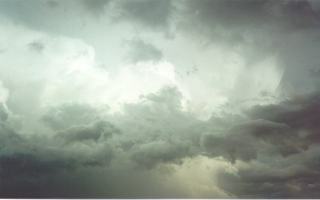 As the storm develops and the breaks and the clouds themselves move, different regions of a thunderstorm are revealed. 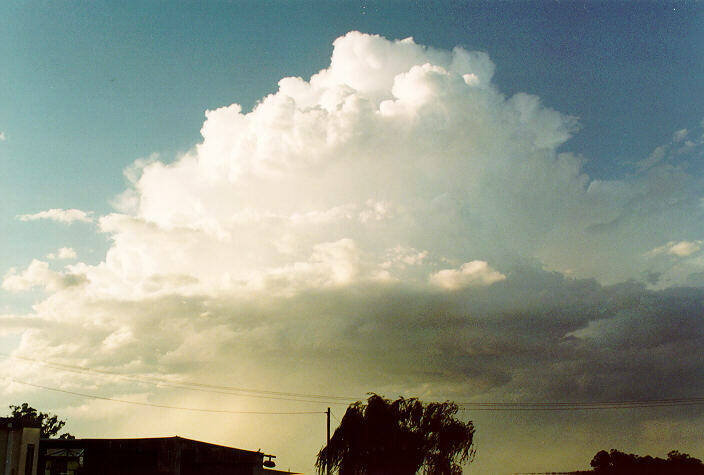 Thunderstorm clouds are known as cumulonimbus. 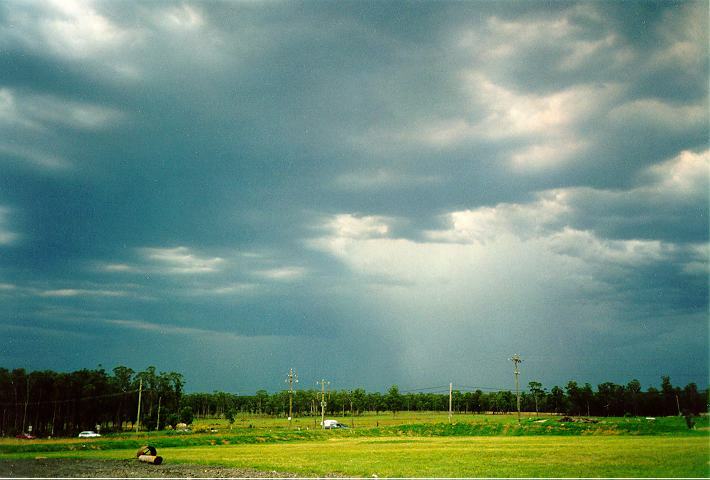 This means that thunderstorms consist of the various types of clouds, mainly the high to middle level cloud types. 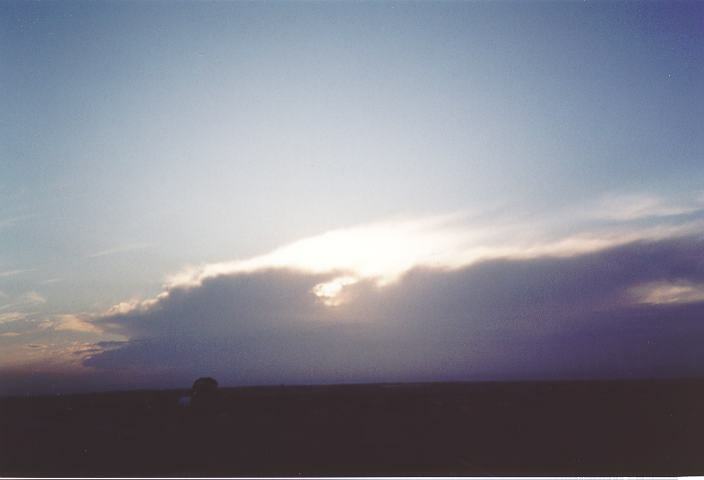 As the storm approaches, the highest clouds are observed in the anvil and thicken to altostratus. 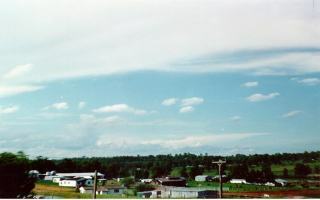 Altocumulus and then the base consisting of the lower clouds are observed as the storm nears. The base is where most of the lower clouds will concentrate. This is the region where most precipitation falls and where the updraught enters. Sometimes, lower clouds develop ahead of the precipitation region depending, of course, on the amount of moisture available and the structure of the storm. 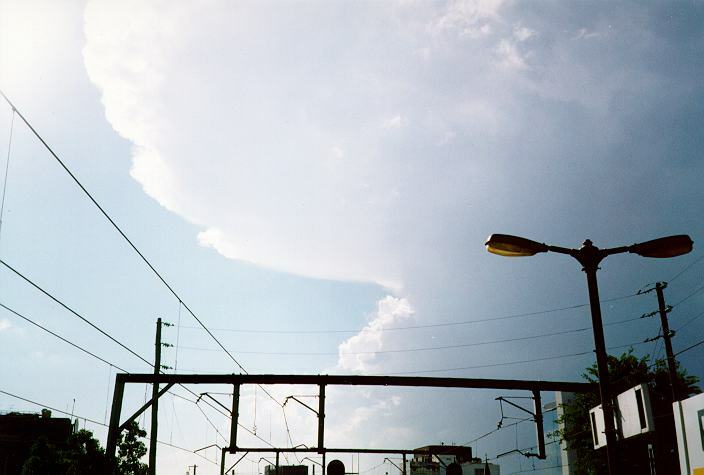 The appearance of thunderstorm structures vary according to the distance of the observer, and the bearing of the observer (side, rear, front or at any other angle). For simplicity, the following discussion refers to a single cell thunderstorm with no other clouds obscuring the view of the thunderstorm. Most thunderstorms in the mid-latitudes move generally in an easterly direction. This of course depends on the middle level wind velocities that steer the storms. This means that if you are located to the south of the storm, the anvil will be facing to your right in the direction of the storm's motion. The rear of the storm will be located to the left, with the precipitation cascade in the left section, usually a distance measuring up to 1/3 or 1/2 of the storm's length. 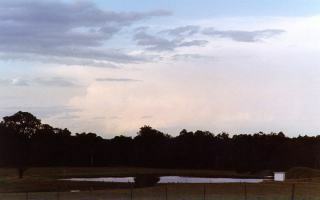 From the northern side of the storm, the opposite situation is observed with the anvil on the left and main cumuliform towers and precipitation cascade on the right. The storm observed from the N normally moves from right to left. The features of storms change or appear to change dramatically with varying distances from the front or rear of the thunderstorm. 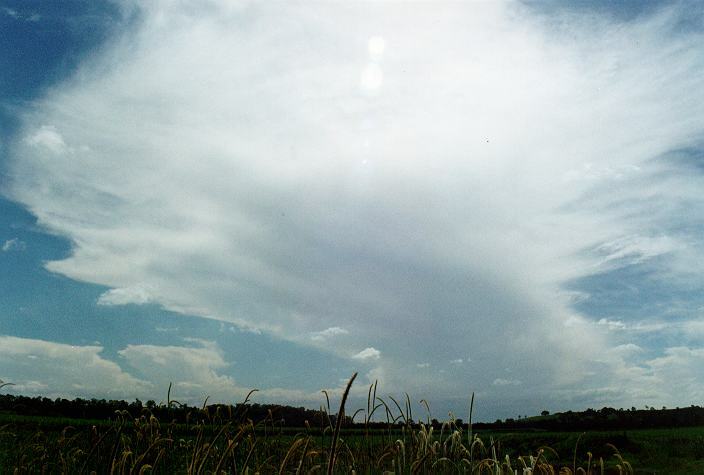 From the front, thickening cirrostratus and altostratus is observed as the anvil approaches. The cloud base will become generally darker. Eventually, the precipitation cascade will begin to appear and sometimes lower 'scud' clouds are observed. Lightning will generally become more frequent as the storm approaches. 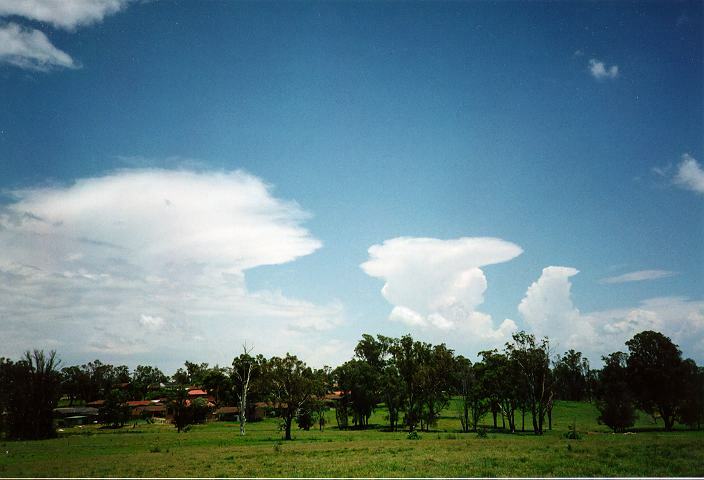 If the side anvils seem to spread evenly outwards, this means the storm is heading or directed towards the observer. If one side anvil is spreading outwards more than the other side, then it indicates the storm will approach at an angle and veer in that direction. 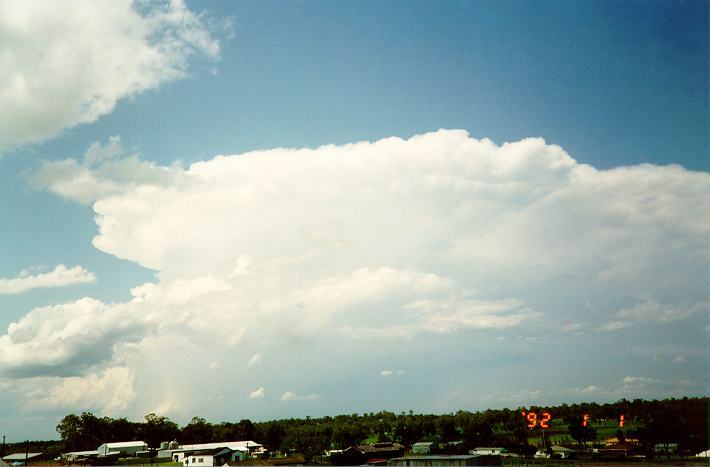 From the rear, the structure of thunderstorms can appear unusually different. It will normally have a rounded top with crisp cumuliform features. Some storms have back anvils and these will be easier to observe closer to the storm. 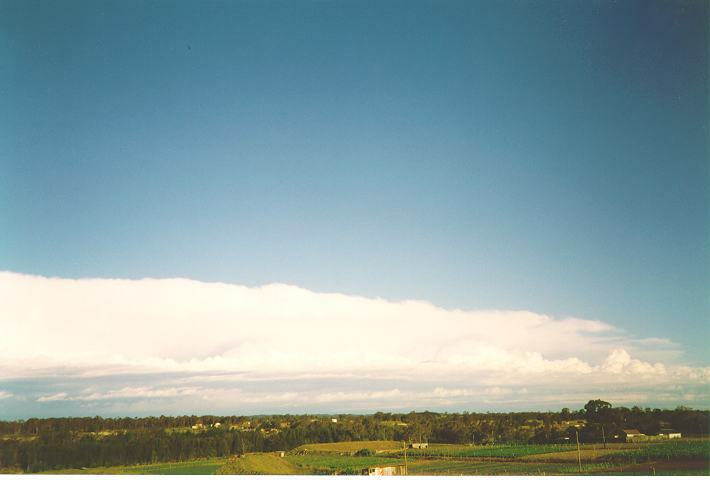 In most situations, side anvils can be observed and if the storm is moving to the left or right of the observers line of sight, more of that side anvil and possibly parts of the front anvil section can be observed. Thunderstorm bases vary dramatically from one thunderstorm to the next. In fact the bases in each thunderstorm vary over its life cycle since it is an ever-changing system. 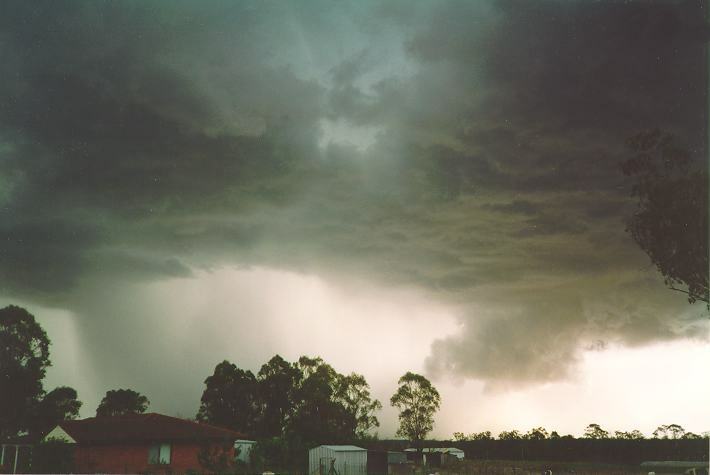 Most thunderstorms are recognised as having dark bases. These bases normally resemble the bases of cumulus in structure but can consist of stratocumulus, fractocumulus and sometimes scud clouds condensing below the bases in the updraught region. The darkness of the bases depends on the base to height thickness of the thunderstorm and on the surface area of the base. In other words, the distance from the bright white sides and top under the base creates higher contrast. It is often wiser to wait until the storm covers the sun or the observer moves under the base to decide on how intense it may seem. Remember, the saying; 'every cloud has a silver lining'. However, in some circumstances the opposite situation occurs. Thunderstorms may not seem so intense at first because of the brightness of the sun scattered by haze reducing the contrast. 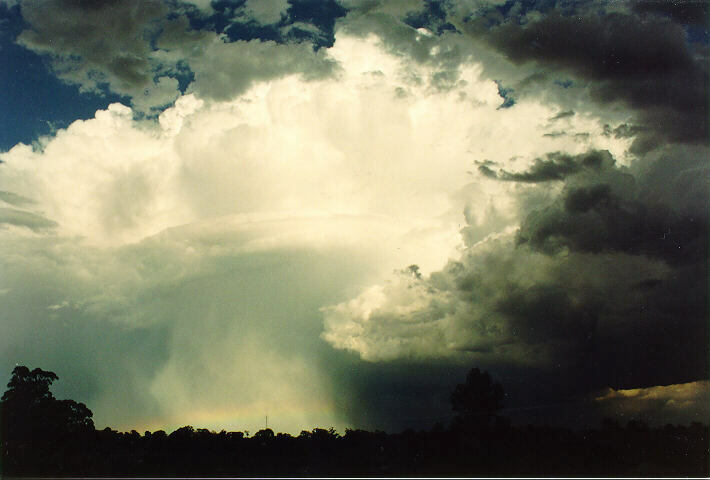 When the sun is obscured by cloud or the thunderstorm itself, the true extent of the base and associated intensity is revealed. 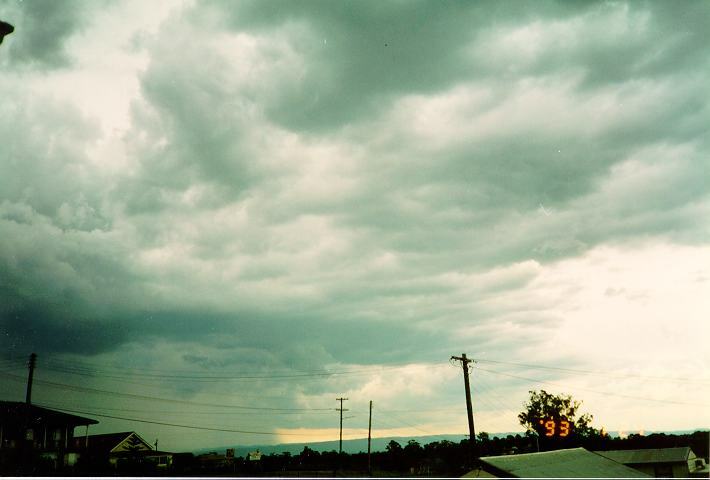 The bases of thunderstorms usually are the best indicators of intensity particularly in terms of precipitation for most observers. 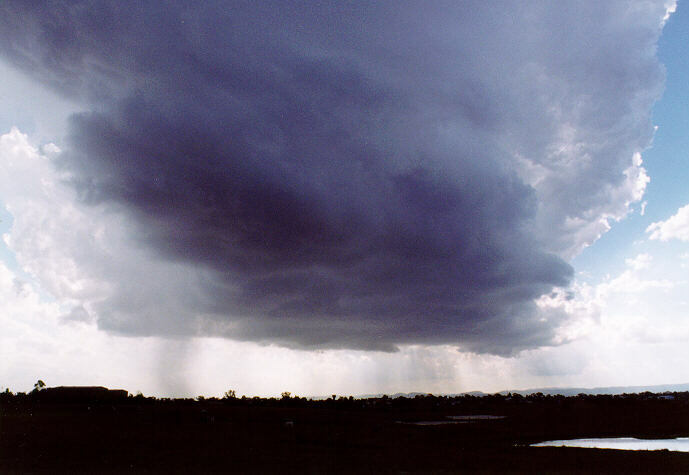 The region where the precipitation meets the clouds is the base of the thunderstorm. However, sometimes precipitation can be observed falling from higher levels above the base particularly from the rear of some storms. Second, and just to complicate things, the storm is moving and therefore influences the movement of precipitation in the direction of the storm. This is particularly important if storms produce relatively weak downdraughts or are still to enter into the mature stage. In other words, if a storm moves from left to right, precipitation falling from the storm will have some component from left to right. This means precipitation will fall virtually straight down in virtually calm conditions, with respect to the speed of the storm. It appears to move with the storm but lags behind somewhat. This is like dropping a bomb from an aeroplane: the bomb almost moves at the same horizontal speed of the plane as it drops. However, if the downdraughts of the storm are fairly strong, they will dominate. So wind blowing in the direction of the storm's motion will direct the precipitation cascade forward. If the wind blows opposite to the storm's direction of motion, then the precipitation will be directed toward the rear of the storm. If storms are moving towards the observer, the precipitation cascade will appear to widen. Observers should be able to determine if a precipitation cascade is directed in, or away from, the storm's direction of motion. The different shading patterns as well as the storm's intensity should give some form of indication of the pattern of air flow from the storm. In the case of a large band such as a squall line approaches, an observer will observe a lighter shade of precipitation (assuming precipitation intensity is fairly constant and similar in duration). By looking away from this region an observer should be able to determine the angle of the falling precipitation. Obviously, the steeper the angle of precipitation in the direction of the storm, the stronger the winds. 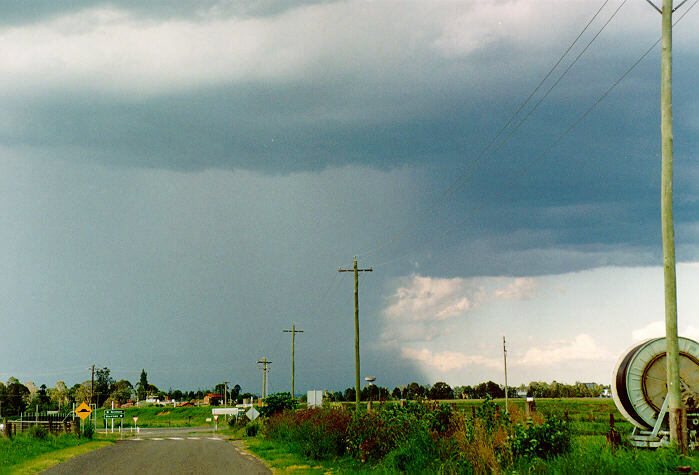 Often, a 'bend' in the precipitation cascade is observed. This means that wind is occurring at a greater strength in the lower layers of the atmosphere. 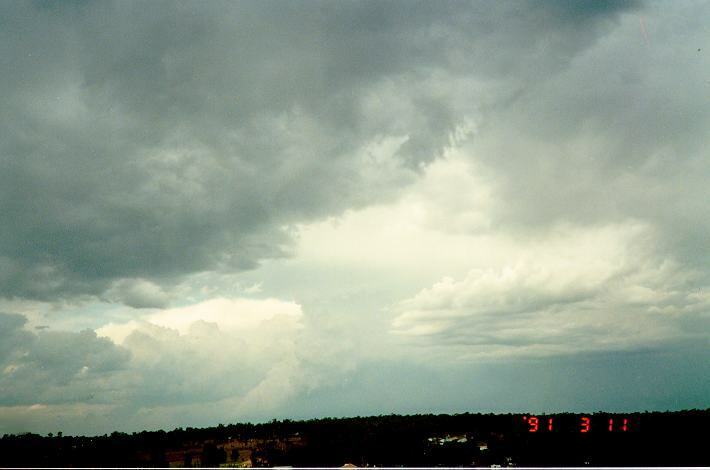 But since air flows in and out of thunderstorms in the form of updraughts and downdraughts, such a pattern of angled precipitation cascades typically occur at the front and rear of the thunderstorm. If the storm is retreating, the precipitation cascade will be observed flowing towards the surface and spreading out. In some cases, the precipitation is being pushed to one side. Precipitation cascades sometimes fall in one direction typically in the direction of the surface winds particularly when the storm is weak, narrow or dissipating so that external (wind) can flow through uninterrupted. Besides the precipitation region, the bases of thunderstorms can produce other unusual features that often can be spectacular. 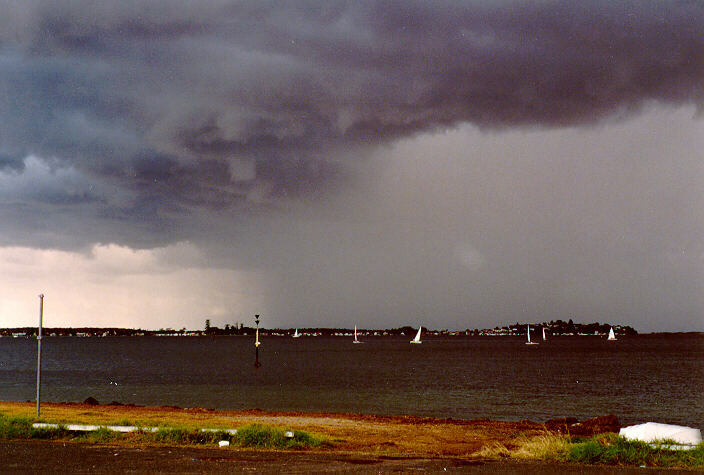 The updraught region at the front of a storm can sometimes exist adjacent to a downdraught. The moist updraught air can cool and condense as it mixes slightly with the cooler downdraught air. The varying wind velocities (i.e. change in wind speed/direction) can cause a horizontal rotation along the boundary of the up and down draught. 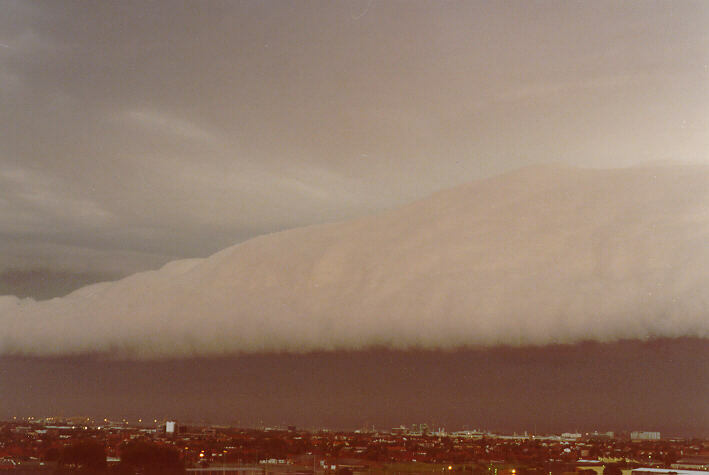 This is visible as a roll cloud. 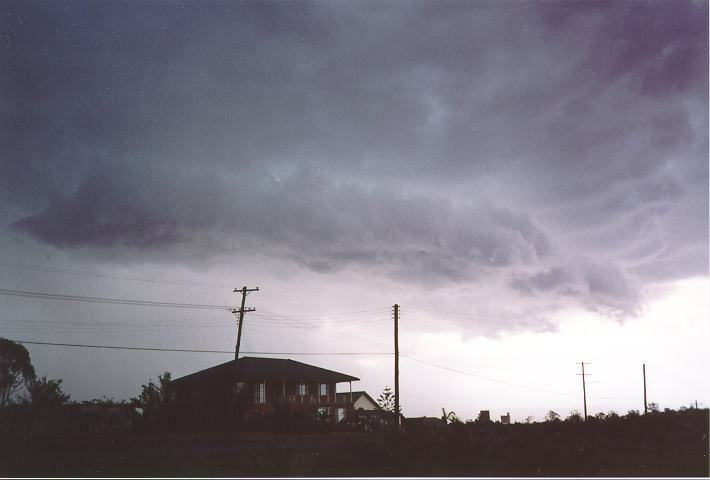 If rotation does not occur, a shelf cloud may develop. 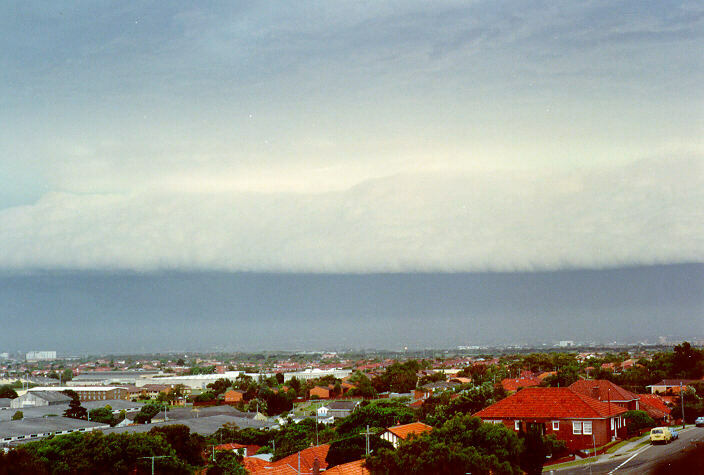 In some thunderstorms, conditions favour the development of wall clouds. 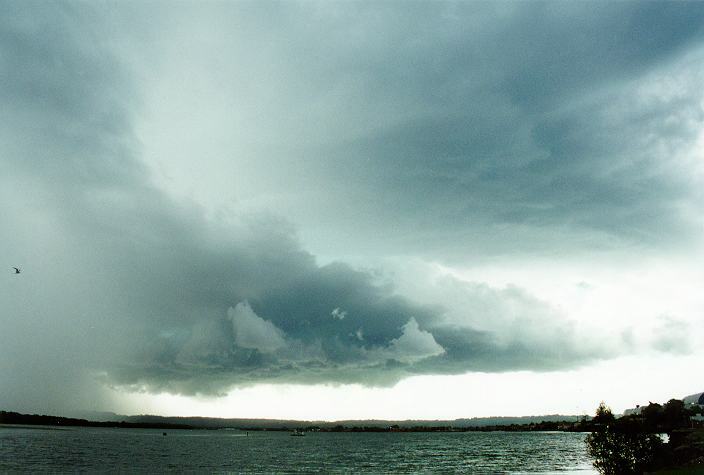 Wall cloud are rotating bases that normally develop in the rear updraught regions of severe thunderstorms. 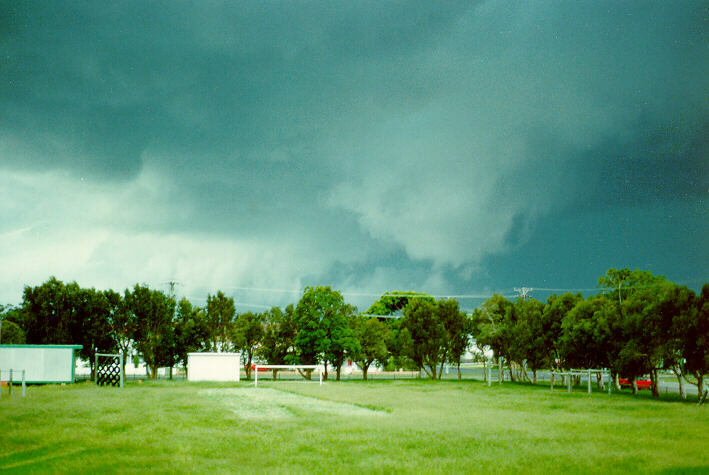 Wall clouds can be used as warning signs of possible tornadoes. The most common identifier of thunderstorms to most people are the lightning and thunder. 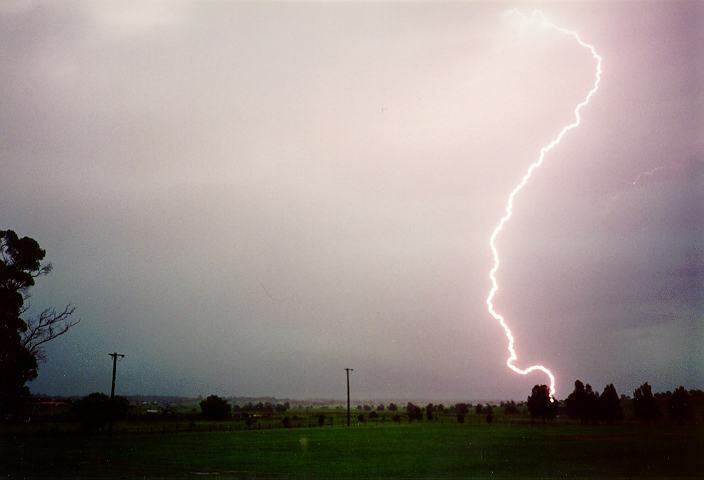 Lightning, especially during the daytime, occur mostly from the bases of thunderstorms. Most observations that the author has made indicate that lightning mostly occur in the updraught or precipitation free bases of thunderstorms. However, lightning can occur from within the precipitation cascade regions. Lightning can also occur from the sides of thunderstorms. 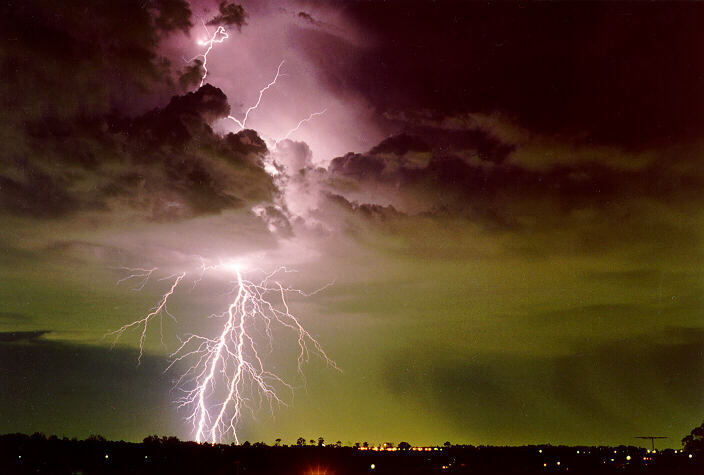 Most thunderstorms produce lightning and thunder. However, the more intense and larger thunderstorms tend to produce more lightning or more severe lightning bolts. Weaker thunderstorms or thundery showers tend to produce lesser lightning and normally less severe bolts. 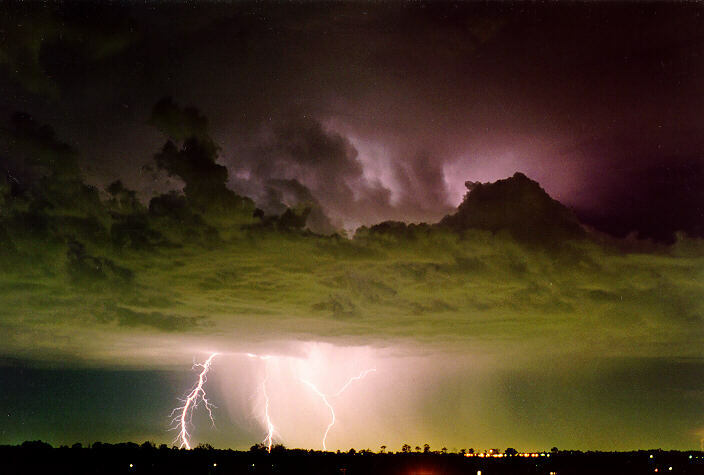 Lightning gives no absolute indication of the severity of thunderstorms such as hailstorms and strong wind events. It is very difficult to describe how lightning and thunder can reveal severe thunderstorms. Definitely, severe thunderstorms are normally well organised and have powerful updraughts that can therefore change the sound of thunder. Severe bolts create crackling sounds followed by a loud bang depending on the distance. 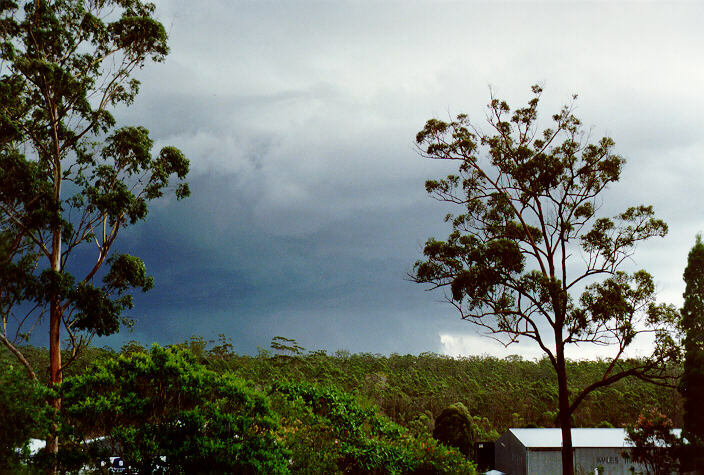 Severe thunderstorms often produce frequent rolling thunder sounds at some10-20km from the observer. Because of the great heights to which severe thunderstorms rise, they potentially can produce very severe bolts of lightning. Lightning strikes are typically thought to be random and unpredictable. But if one looks closely, lightning mostly strikes the tallest objects or objects that are most isolated in a flat region. Mountains, trees, telegraph poles, high rise buildings in the cities and even fishing rods out on a boat are anything that can attract lightning. This is why golfers are so often amongst the victims of lightning strikes. They are often playing out on the golf course and as a storm approaches, they take cover under the few trees that are around. Please contact your local weather authority on more information about what to do in terms of lightning. 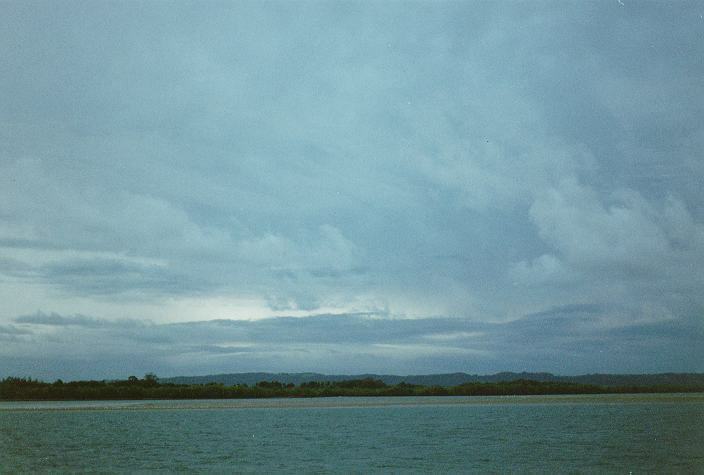 An observer can estimate the distance of a storm. This is done by measuring the time in seconds it takes for thunder to occur after the lightning has occurred. If it takes 10 seconds for instance, you multiply the 10 seconds to 340 (which is the speed of sound in air). This means the storm is about 3400 metres away or 3.4 kilometres. This method is also discussed in the night observation section. Using radios for lightning detection and hence thunderstorm is very effective. A crackling interference sound on what normally is a good signal on radios occurs when storms are around. Increasing interference means more increased frequency of lightning and hence an approaching storm. In some cases, the storm is increasing in intensity with more lightning activities. So this method should be used in conjunction with other observations. There are many synoptic situations that exist where thunderstorms will develop. 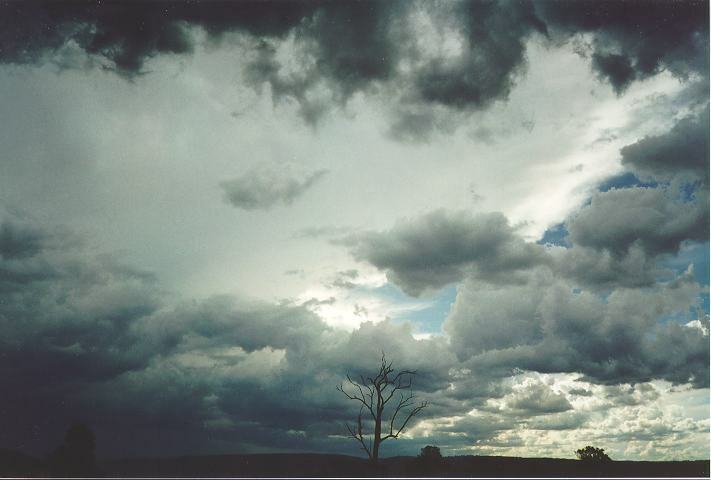 Thunderstorms can develop ahead of, with, or behind the passage of cold fronts. (There are no specific patterns that exist to suggest thunderstorms of certain intensities develop with certain types of synoptic conditions).Thunderstorms can also develop with lows or troughs of low pressure usually in the eastern section. 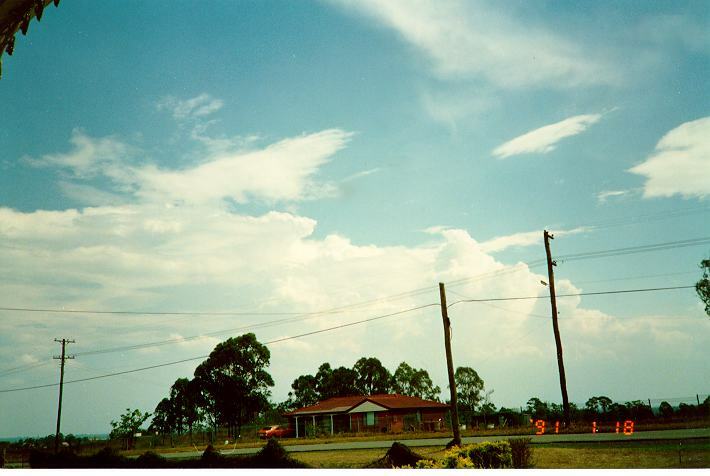 Other situations that favour development of thunderstorms are upper air disturbances, cold pools of air in the upper atmosphere and trough lines which can exist ahead of cold fronts or in a trough of low pressure. These synoptic situations provide the necessary atmospheric conditions where thunderstorms can develop. The other factors that are required for thunderstorm development are sufficient low level moisture and something to lift this moisture up into the atmosphere as fast as possible. Uplift is the flow of air from the lower layers towards the upper layers. Types of uplift include unstable air, cold fronts acting as wedge for warm air, cold air in the upper atmosphere or orographic forcing as air meets a mountain range. Sometimes more than one form of uplift can occur simultaneously. 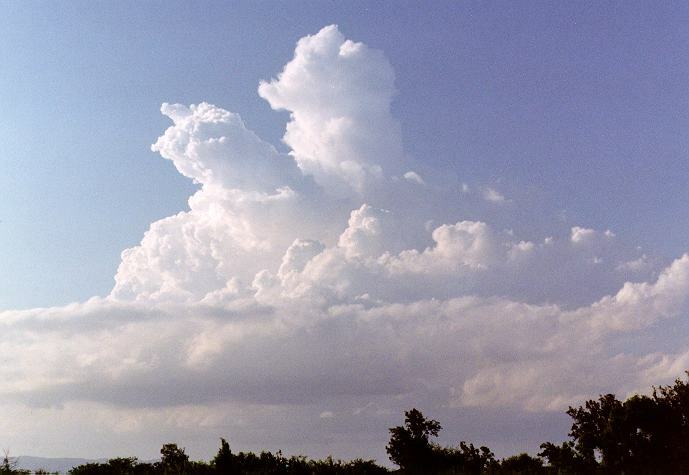 It requires a minimum level of uplift for cumulus to develop further into thunderstorms. There are three main stages of development of thunderstorms. They are the developing or cumulus stage, the mature stage and the dying or dissipating stage. 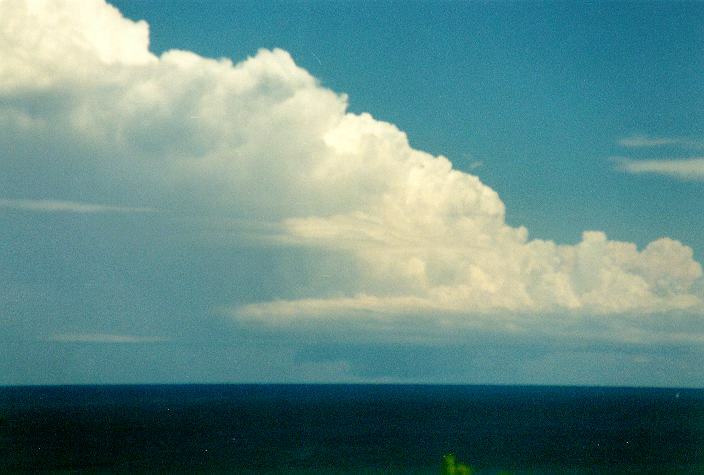 Once uplift begins to occur, the low level moisture is forced upwards forming cumulus at the cloud condensation level. 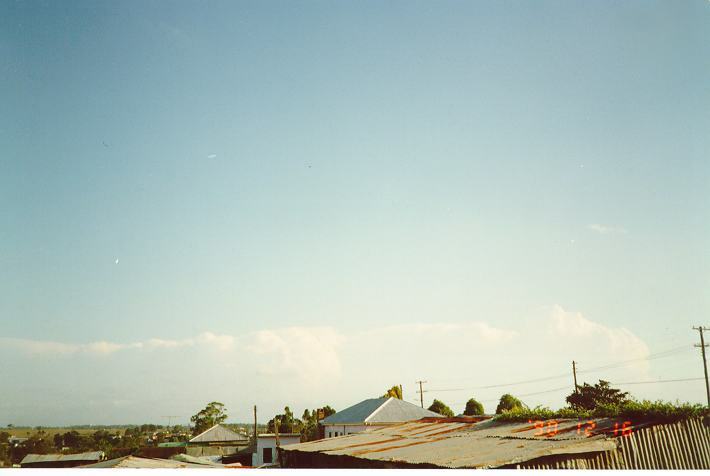 The developing or cumulus stage is where the cumulus grows larger than normal. The base of the cumulus may develop scud clouds but little or no precipitation will fall. The tops will become more crisp as the cumulus enters colder temperatures at higher altitudes. The height that it reaches depends on the strength of the updraughts. As it does so, it begins to develop an anvil, usually in the direction of the cloud motion. On days of unstable air, many cumulus clouds will develop but only a few will dominate. The updraughts of the main developing cell will retrieve air from the surrounding and interrupt the updraughts of nearby cells. They will tend to dissipate or decrease in size. The developing stage is not a continuous stage leading straight through to the thunderstorm's mature stage. The main cell may develop a top a few times which dissipate and develop before a stronger updraught will push through and become stable. 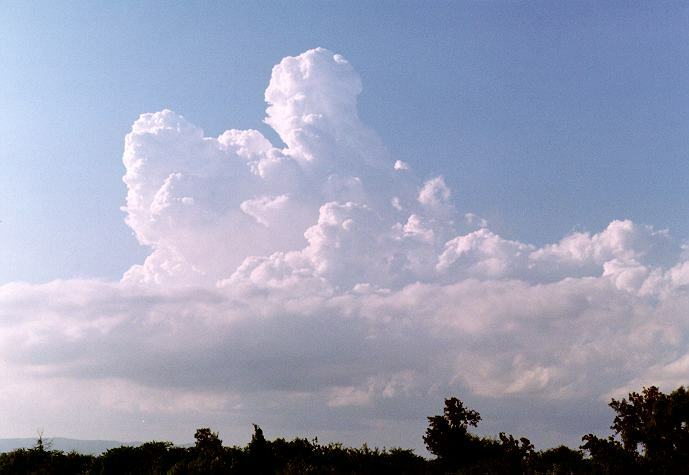 The cumulus grows larger in all directions as the flow at the top slows down. Also, middle level winds pushes the main cloud forward allowing for newer cells to develop at the rear. Winds at higher levels are usually stronger than the rest of the cloud which means the towering cumulus cloud will lean forward slightly as it develops. However, this is not always the case. Some precipitation may begin to develop with the first lightning and thunder observed as the storm enters the mature stage. Some downdraughts may begin to develop. 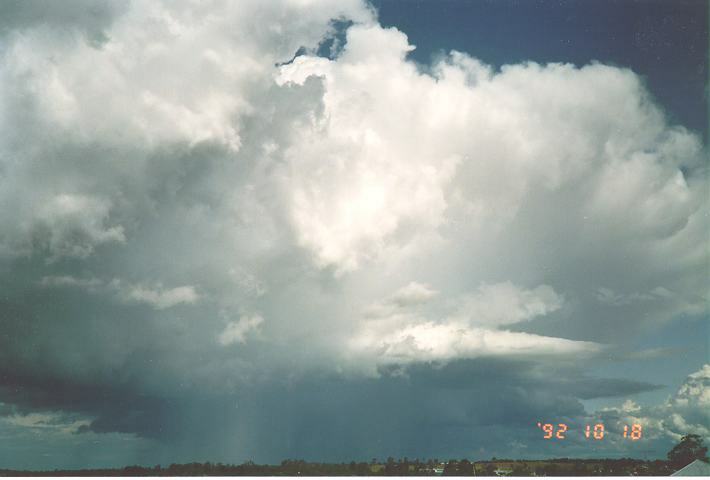 The mature stage is where the storm produces most of the precipitation and consists of downdraughts and updraughts. It is a fully operating processing system with water vapour condensing as it rises with the updraughts and excess air and moisture mostly in the form of precipitation is released in the downdraughts. The anvil has developed and continues to move forward. 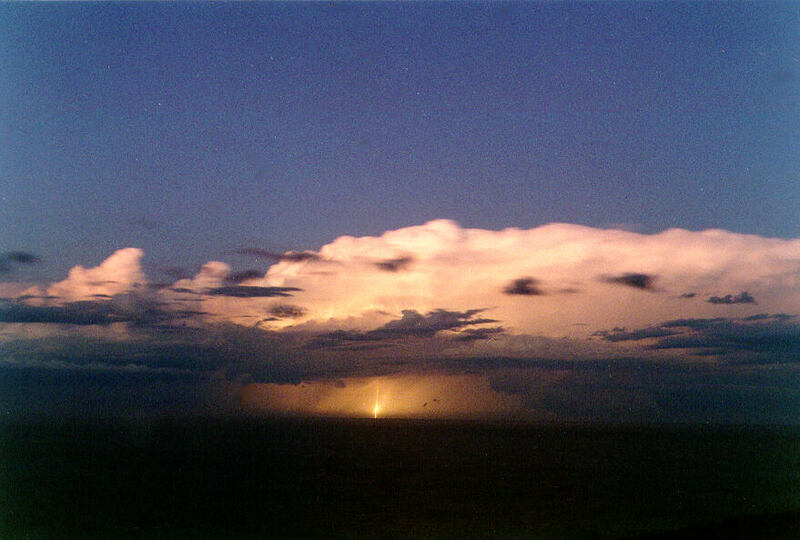 Lightning and thunder are more prominent during this stage than any other stage of its life cycle. A storm will remain in its mature stage for as long as the updraughts can supply water vapour to the storm. If the lower level air becomes drier so that there is insufficient moisture or the conditions become more stable so that uplift becomes impossible, the storm will begin to dissipate. This also occurs if the downdraughts interrupts the supply of the updraughts, cutting the supply of moisture to the storm. Other storm cells may develop, but this storm goes through the dying or dissipating stage. During the dissipating stage, the storm will gradually rain itself out. Precipitation decreases and lightning becomes less frequent and ceases completely once the storm becomes weak. The stronger winds aloft continues to spread the ice crystals forward so the anvil is the last section to remain. In fact the cloud seems to resemble a thick area of cirrostratus and altostratus. 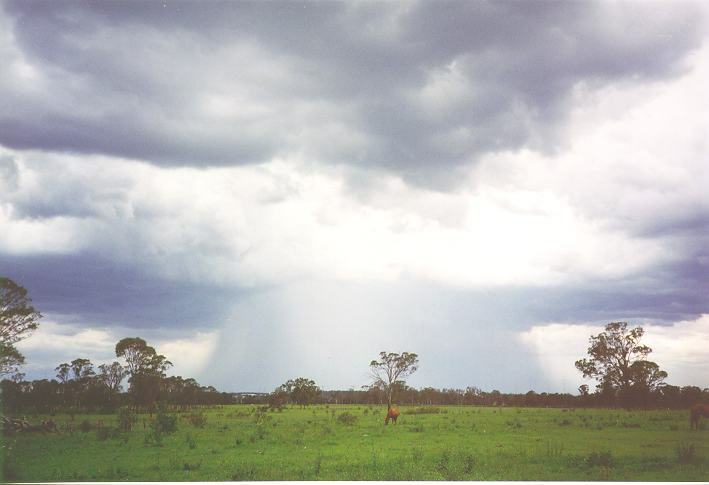 Large drops of rain tends to be the main form of precipitation but isolated. Eventually the storm disappears completely. 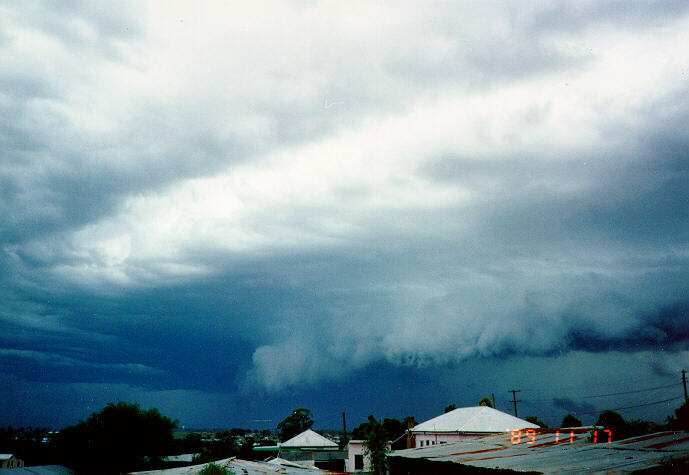 The severity of thunderstorms depend on the amount of organisation associated with the various types of synoptic situations as well as the concentration of lower level moisture. Severe thunderstorms require the lower level moisture to be uplifted quickly into the atmosphere. 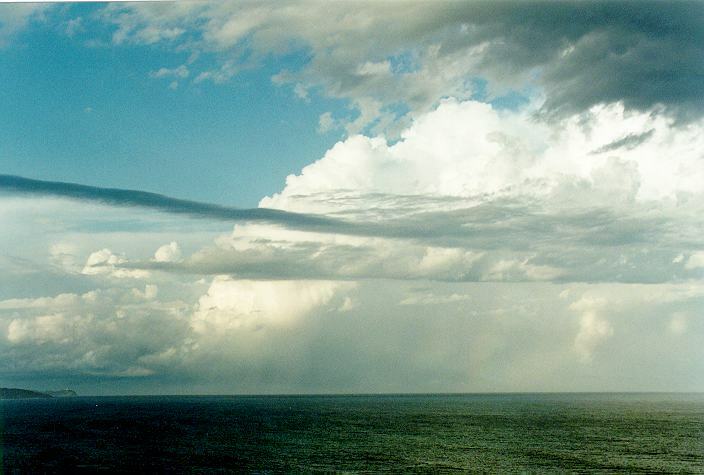 The air gets processed in the form of cloud formation. At the same time there needs to be some way of getting rid of excess moisture through an 'exhaust' system. 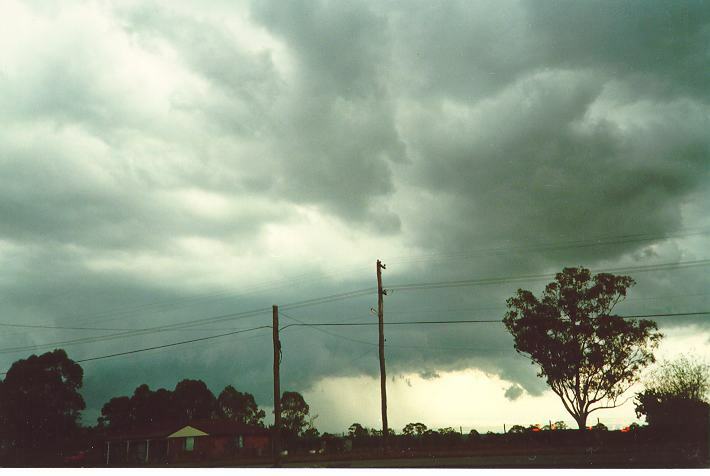 Severe thunderstorms therefore have very organised updraughts and downdraughts that do not affect each other. Another form of 'exhaust' is upper level winds. Strong upper level winds can act like a vacuum cleaner allowing uprising air to escape more efficiently along the anvil. 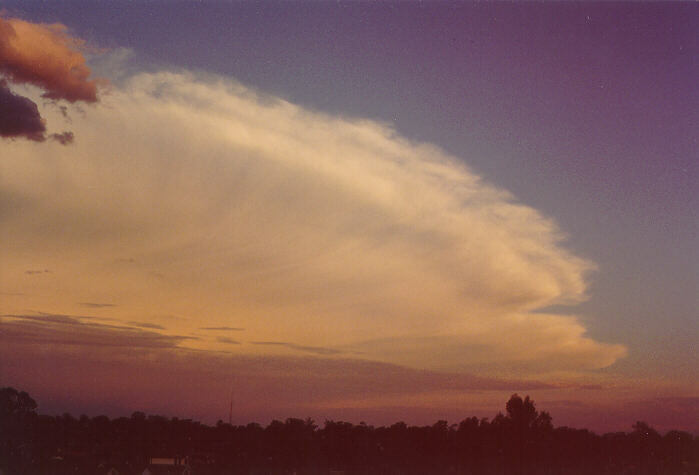 Long, straight and well defined anvils indicate this effect is occurring. There are several major types of thunderstorms. By the major types, I mean the more common types that are observed around the world. In recent years, thunderstorms have been categorised even further but these will not and does not really need to be discussed. 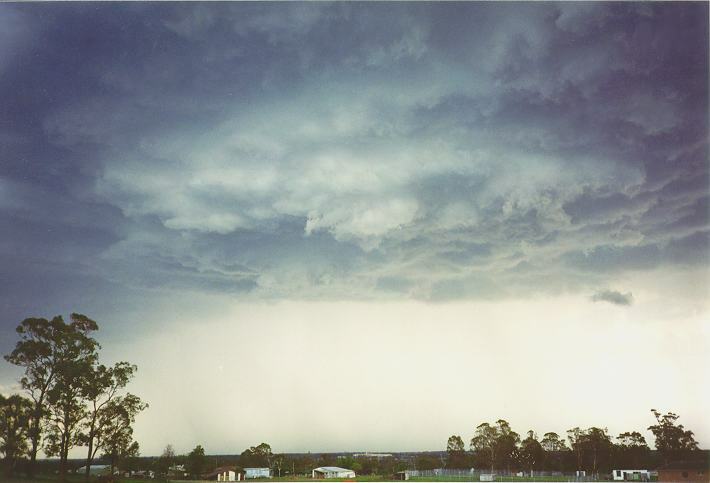 The main types of thunderstorms are the single cell, multicell, squall line, and the supercell. 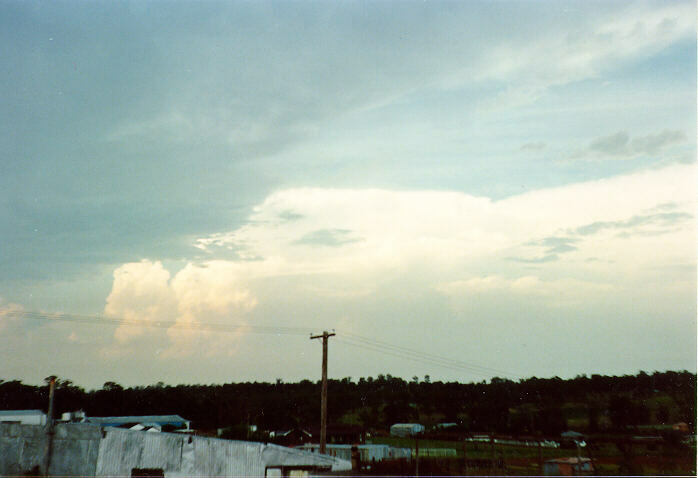 Single cell thunderstorms are those thunderstorms that develop independent of other thunderstorms. They simply go through the development stage, the mature stage and then dissipate without creating other cells. They may develop over a mountain or isolated hill. Single cell thunderstorms are not recognised as being very severe but occasionally, some larger single cell thunderstorms may develop with varying types of severe weather. Multicell thunderstorms are thunderstorms consisting of several cells adjacent to one another in the various stages of development. 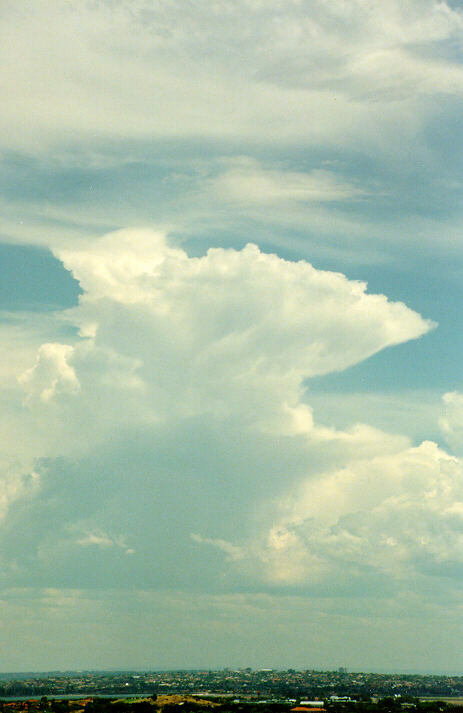 In most cases, thunderstorms tend to develop in adjacent clusters called multicells. However, multicells tend to go through several stages of development that allow for a longer life span. 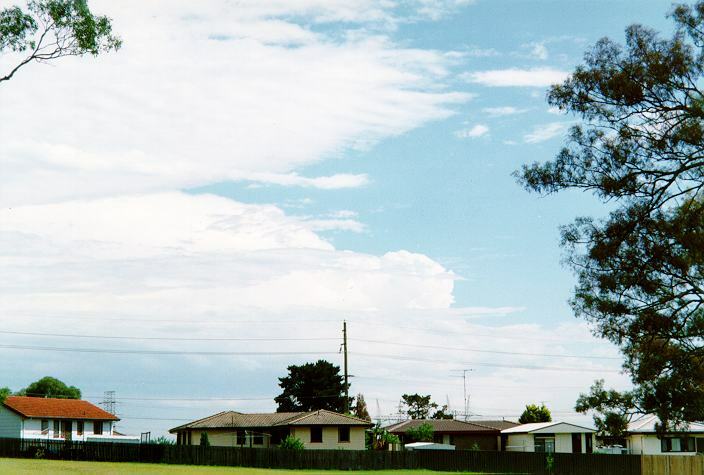 As cumulus develop, the dominating cumulus begins to grow into large cumulus eventually to produced light precipitation. 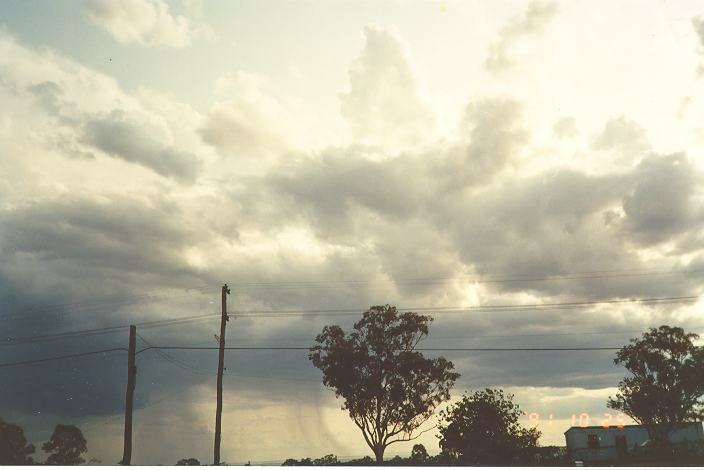 As this precipitation and corresponding downdraught descends, evaporative cooling (evaporation is a cooling process) causes the air to accelerate towards the ground and flow outwards. In certain conditions, the descending and out flowing air can act as a wedge as the colder out flowing air undercuts the warm moist air in the regions surrounding the main cell. This can have the effect of intensifying updraughts of surrounding cells. These cells grow into their mature stage and also send down precipitation and become the dominant cell. At the same time, the newer cell produces downdraughts that interrupt the updraught of the original cell. Consequently, the older cell will begin to dissipate. This process is so efficient that the storm can last for up to a few hours or more with a continuously changing structure. Because of the unusual structure of multicells, the developing and dissipating process causes the storm to have a motion veering slightly at an angle to each cells line of motion. In other words, if for example the cells are moving east, multicellular development on the northern side has the effect of veering the overall storm to the northeast. An observer located to the east of the original cell will notice the original cell dying and the newer cell with precipitation developing to the north. The main precipitation will miss the observer. This peculiar motion of multicells has confused and still confuses many people such as farmers into thinking the storm has 'changed direction' or 'come back again'. This confusion is due to the newer cell developing in a region on the side or even towards the rear side of the storm. Rapid development at the rear can also make a multicell appear to move in the opposite direction. These storms represent the best examples of ever-changing systems. 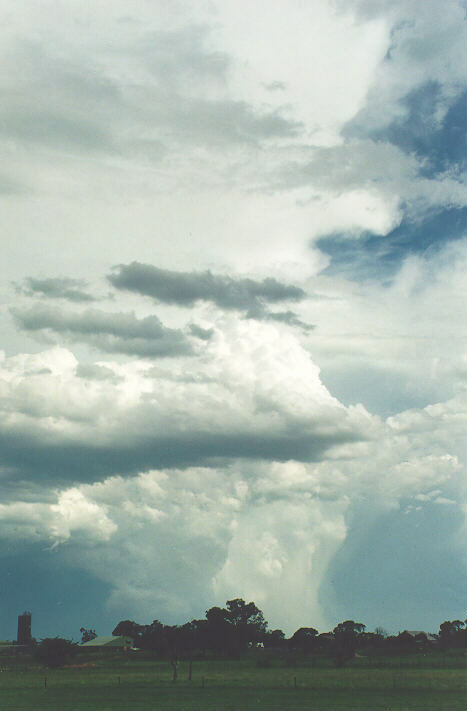 Multicell thunderstorms can become severe and depends on how efficient the arrangements of the downdraughts and updraughts. 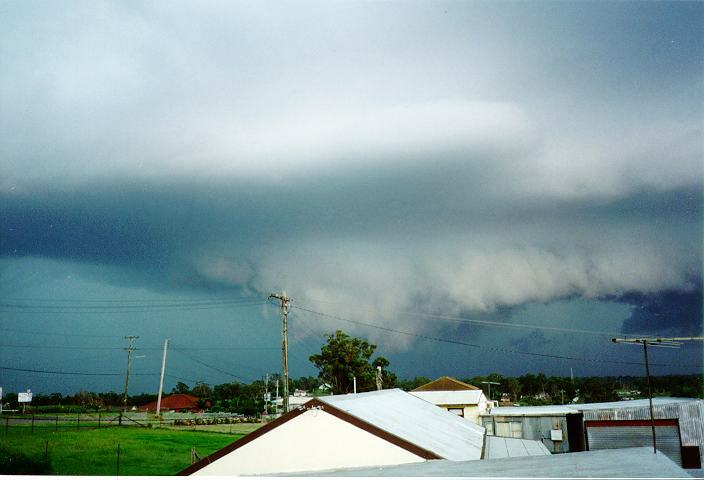 All types of severe weather can be experienced from severe multicells including giant hail, severe winds and tornadoes. Squall lines are systems of thunderstorms arranged in a line. This line can extend for several hundred kilometres. Squall lines are normally very severe and produce some of the strongest straight line winds. It can produce other forms of severe weather even weak tornadoes. To a certain extent, a squall line resembles a long system of multicell thunderstorms. The development is occurring on one end and dissipation is occurring on the other. 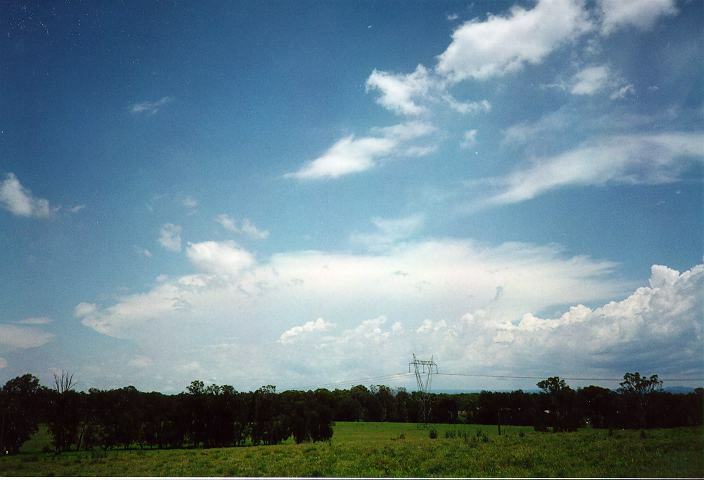 However, in between these ends, the storm is very similar with a large anvil extending well ahead of the main body. There are no separate cells as is the case for multicells. 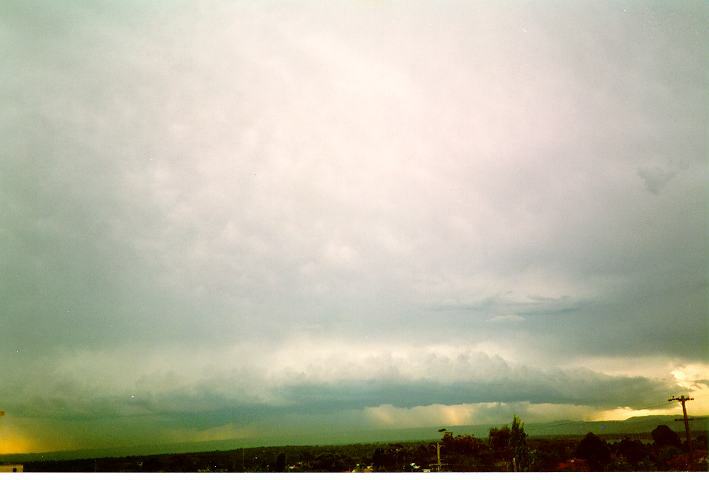 As it approaches, a shelf cloud is normally observed with an extensive precipitation cascade. An approaching squall line is very dark and very spectacular. As it approaches, an observer will notice the strong updraught flowing into the storm band. A brief lull in the wind will be replaced with a sudden blast or squall of wind from the storm in the opposite direction (the downdraught). Moderate to heavy precipitation occurs near the downdraught. The precipitation will gradually decrease. The rear section is usually less spectacular but consists of a back anvil. Squall lines develop as a result of a line boundary where warm moist air is undercut by colder air. Consequently, the downdraught flows down just behind the updraught. This is the reason why the shelf cloud develops. The cold air flowing downward condenses some of the water vapour contained in the updraught. Squall lines move mostly at right angles to the direction of the cloud band. There is no confusion as in the case of the multicell type. At times, they can move quite rapidly. 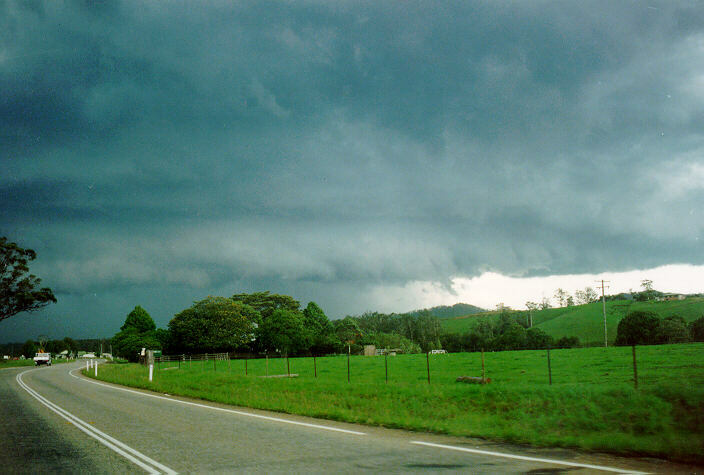 Supercell thunderstorms are the largest and the most severe of all types of thunderstorms. In fact supercells are so large they show up on a satellite photograph in the shape of a tear drop. Other types of severe thunderstorms also show up on satellite but individual cells are more difficult to make out. 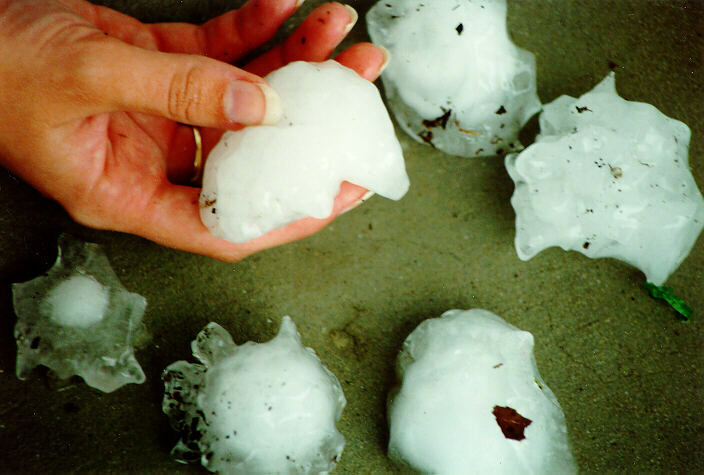 Most of the large tornadoes and giant hail events are spawned by supercells. They are also known for producing very severe straight line winds. The reason why supercells are the most severe is because of their rotating structure. The updraughts spiral into the storm and are not interrupted by the downdraughts which descend from a separate region of the storm. The supercell itself is mainly one large cell. Because of the powerful updraught, the anvil extends a long distance ahead of the main body of the storm. The side anvils in particular are very thick and crisp. 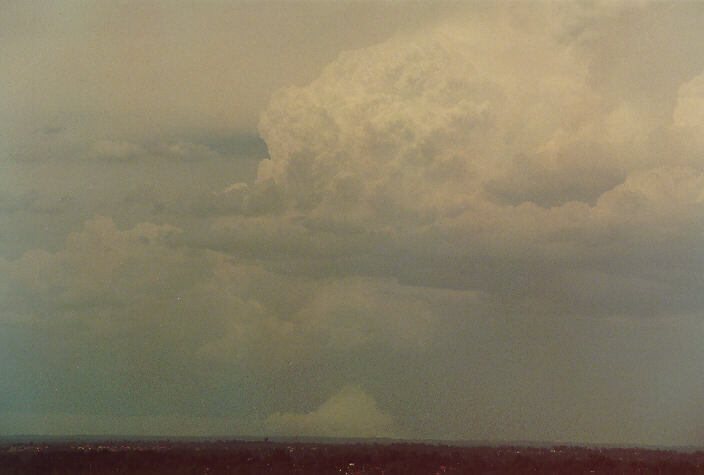 Towards the rear of a supercell thunderstorm, a dome protrudes above the top. This is also a result of the powerful updraught shooting through the inversion. The rear section of the supercell consists of a flanking line: a line of cumulus cells decreasing in height away from the main cell. 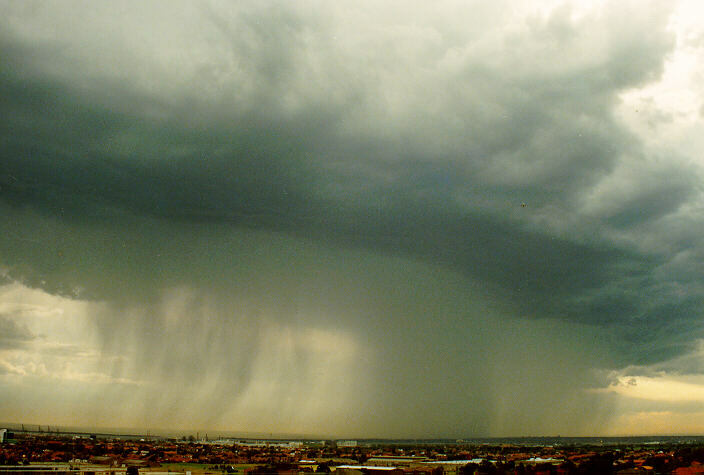 Various sections of a supercell consist of the different types of precipitation. Medium sized hail exist near the gust front with large to giant sized hail in the central section. This is often known as the hail shaft. The region where the flanking line meets storm is where wall clouds and tornadoes normally develop. Not all supercells produce wall clouds or tornadoes. These only develop when conditions are ideal. 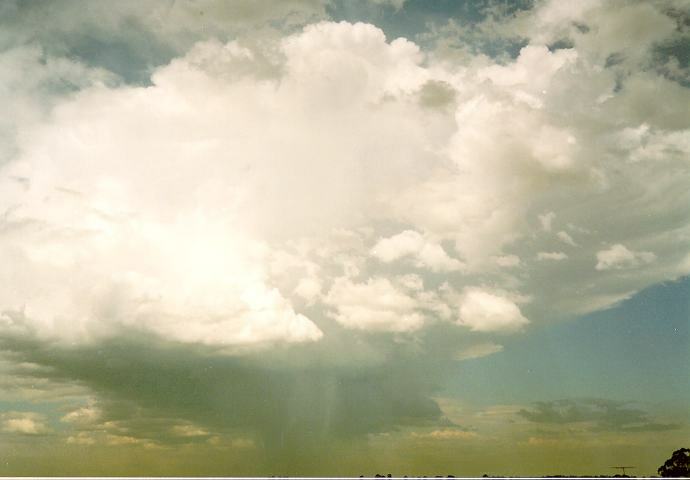 Tornadoes and wall cloud development are discussed further in the section on tornadoes, water spouts, land spouts and dust devils. Unlike other storms, once supercells develop they produce their own energy. 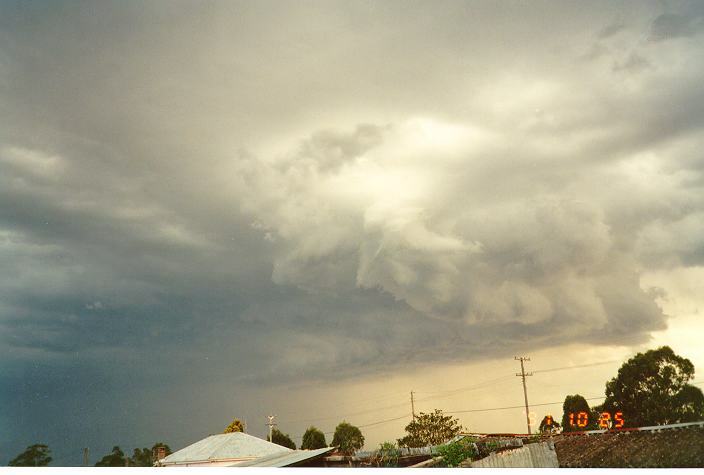 They are often regarded as mesocyclones. They do not require cold fronts or other forms of uplift to maintain their updraughts. Because of this efficiency, they last and may produce severe weather for several hours. There are several complex factors that influence severity of supercells. The main factors are the strength of the updraughts and the strength of the upper level wind speeds. Particularly severe supercells have strong upper level winds which, based on the structure of supercells, has the effect of strengthening downdraughts and updraughts of the supercell.